The Colorizer feature of the VisualizationLayer allows you to colorize the MapShapeData objects inside it on the basis of a condition. 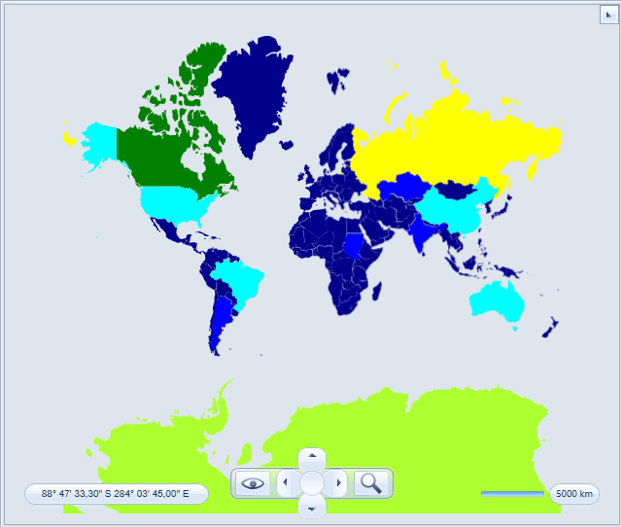 For example, you can create maps that display shapes for each country with fill color depending on the population of the country. In order to allow you to color the shapes depending on a condition, the VisualizationLayer class exposes the Colorizer property, which is of type IMapShapeColorizer. ColorMeasureScale - sets filling to the map shapes using value of one of the extended properties. GraphColorizer - sets filling to the map shapes using the coloring of graph approach. To use the ColorMeasureScale object in a layer, just set the Colorizer property of the respective layer to a new instance of it. Here is an example. The ColorMeasureScale object colors the MapShapeData objects inside a layer on the basis of a value. This value should be specified through the ExtendedData for the MapShapeData object. The Extended Data represents a set of properties and their respective values. In order to specify the desired property from the Extended Data, you have to use the ExtendedPropertyName property of the ColorMeasureScale object. For purposes of this example we will use world.shp ESRI shape file. The extended data for the shapes from this file contains “SQKM” property which represents area of the country in square kilometers. 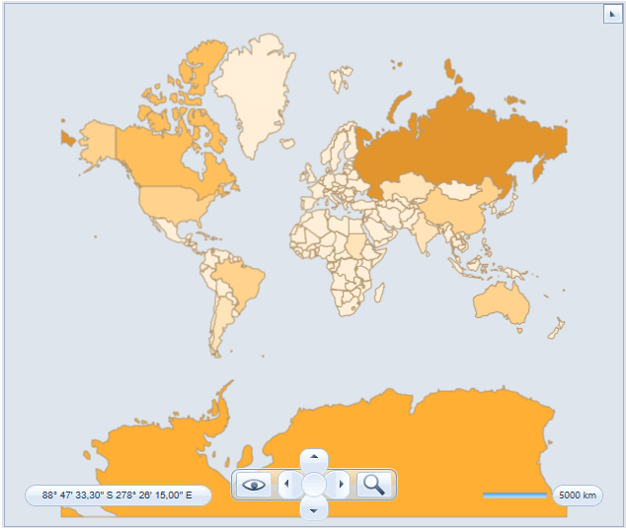 Here is an example, in which the MapShapeData objects get colored depending on the value of the country area. When using the VisualizationLayer object together with one of the asynchronous shape readers (AsyncShapeFileReader, for example), the reader automatically force changing of the ColorMeasureScale properties. In this case you have to only use the Mode and one of the two additional properties. When you are using manually generated shapes, you have to create the ranges manually. To learn more read the Ranges section. In case you have more ranges than colors the specified colors will be used as gradient stops along the scale to create filling for all ranges. For example if you want to have the same highlight color for all of the ranges, you just define one entry in the HighlightFillCollection property. With the approach shown above any 2 shapes (even if they are neighbors) may be colored equally. To avoid this you should use the Graph Colorizer. Another approach is to manually define the Min and Max values of the ColorMeasureScale object and to use the Mode property together with the TickMarkCount or TickMarkStep property. This approach is useful, when having VisualizationLayer that displays manually generated shapes. Additionally with the Min and Max values defined you can directly define the desired ranges at design-time via the RangeCollection property of the ColorMeasureScale object. In this case you can either use the HighlightFillCollection and ShapeFillCollection properties, or specify the desired colors via the HighlightFill and ShapeFill properties of the MapRange object. Here is an example.